Stan’s guest this week on the podcast is David Blight of Yale University, author of the pathbreaking new biography, Frederick Douglass: Prophet of Freedom, published by Simon & Schuster. David talks about the 12 years he worked on the book, the private Savannah collection of Douglass papers that opened up new insights into Douglass’s extraordinary life, and Douglass’s place in American history. This entry was posted in Books, Culture, People, Public History, Writers and tagged podcast on November 14, 2018 by Stan Deaton. Stan’s guest this week is Jim Jordan, talking about his new book, The Slave-Trader’s Letter-Book, published in 2018 by UGA Press. Jim tells the fascinating story of Savannah businessman Charles Lamar, who in 1858 illegally brought one of the last shipments of enslaved Africans to the United States, and whose papers were confiscated by the U.S. government after the Civil War. In 2009 the letters were rediscovered in a New Jersey attic, rescued by Jordan, and donated to the Georgia Historical Society. Jim talks about Lamar, the slaveship Wanderer, and the story of the missing papers. This entry was posted in Books, People, Public History and tagged podcast on October 26, 2018 by Stan Deaton. This entry was posted in Books, Culture, People, Public History, Writers and tagged podcast on October 19, 2018 by Stan Deaton. 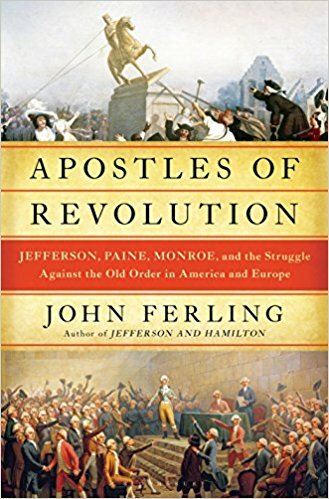 Stan talks to author John Ferling about his new book, Apostles of Revolution: Jefferson, Paine, Monroe and the Struggle Against the Old Order in America and Europe. This entry was posted in Books, Culture, People, Public History, War, Writers and tagged podcast on October 5, 2018 by Stan Deaton. Among historians writing about the era of the American Revolution, David McCullough, Joseph J. Ellis, Gordon Wood, and Ron Chernow have received the lion’s share of attention in the public arena over the last 20 years. None has been as prolific as John Ferling, however, and none, with the possible exception of Wood, has written for a popular audience with more scholarly erudition. I first met John Ferling in 2000 when he was still teaching full time at what is now the University of West Georgia in Carrollton. He came to Savannah to speak at the Georgia Historical Society about his new book, Setting the World Ablaze: Washington, Adams, Jefferson, and the American Revolution (Oxford University Press), a prosopography of those three Revolutionary stalwarts. Despite teaching full-time, John had already written acclaimed biographies of Washington and Adams, as well as four other books on Early America. After our first meeting in 2000, John would go on to write eight more books on the Revolutionary era over the next 18 years: A Leap in the Dark: The Struggle to Create the American Republic (Oxford, 2003); Adams vs. Jefferson: The Tumultuous Election of 1800 (Oxford, 2004, a volume in the “Pivotal Moments in American History” series); Almost a Miracle: The American Victory in the War of Independence (Oxford, 2007); The Ascent of George Washington: The Hidden Political Genius of an American Icon (Bloomsbury, 2009); Independence: The Struggle to Set America Free (Bloomsbury, 2011); Jefferson and Hamilton: The Rivalry That Forged a Nation (Bloomsbury, 2013); Whirlwind: The American Revolution and the War That Won It (Bloomsbury, 2015), and his latest. I’ve written elsewhere on this blog about John’s ability to plow the same ground without saying the same thing. His latest entry remarkably achieves the same goal in that this is the fourth book he’s written with Jefferson’s name in the title, yet he still has new things to say about him. Here Jefferson is foremost among three “apostles of revolution” who sought real and radical changes in the political, social, and economic structure of America and Europe in the last decades of the 18th century and early years of the next. Thomas Paine to my mind is the most fascinating of the three but also the one whose inner life is most difficult to penetrate. Despite being the subject of several biographies, he is still a somewhat shadowy figure who remains on the historical margins. Paine was something—to use a word from our own day—of a slacker. He never kept gainful employment for very long, and he moved frequently between cities and countries. He is best known, of course, for his writing, and some of it still has the power to electrify. A couple of years ago I read his Age of Reason, an open attack on revealed religion and came away amazed at his intellectual bravery. It would take guts to write that book now, much less in 1795. Monroe is the most problematic member of this book’s triumvirate, both in terms of his historical and intellectual heft. He’s always seemed something of a lightweight when compared to his historical contemporaries. Ferling certainly gives him a well-deserved spotlight, but the jury is still out on whether he has elevated Monroe’s stature among the leaders of Revolutionary word and deed in the Early Republic. It brings to mind something I read recently about Irving Brant, the author of a monumental 6-volume biography of James Madison, published between 1941 and 1961. Brant wanted to prove that Madison had been unfairly overlooked as one of the mainline founders. When the project was completed, reviewers gave it high praise for its thoroughness, but one critic said that it was so thorough that, instead of rescuing Madison from the Founding B-team, Brant had inadvertently proven that Madison was in fact quite rightly at home among the second-tier. This caveat aside, John Ferling has once again given those of us who can’t get enough of the original “Greatest Generation” another literary feast—and this won’t be his last. I have it on good authority that he’s already written the first draft of his next book. Is it too early to pre-order? This entry was posted in Books, Culture, People on August 26, 2018 by Stan Deaton.